Black Real Lether cassette with 2 decks playing cards and 96 Chips (32 piece 5, 32 piece 10, 16 piece 50, 8 piece 100, 8 piece 500). Size: 29 x 16 x 6,5 cm. 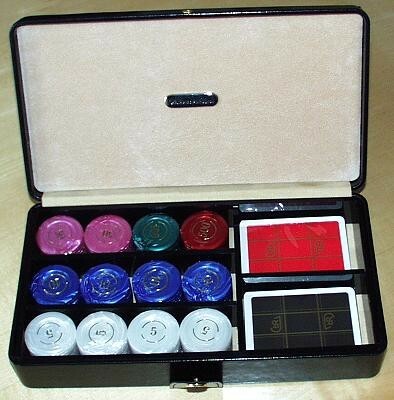 Renzo Romagnoli’s items are a refined, elegant and prestigious versions of traditional games, game sets with cards and chips, chessboards, bingo, backgammons case;they are easily recognisable by the accurate work, elegance and beauty. Renzo Romagnoli’s items are appreciated and sold in most of the best selling points of the world.